I must admit that the BMW G 650 GS was not my first choice of bikes to ride. Usually there is more than one test bike in the garage, and the single-cylinder 650 GS was consistently getting overlooked in favour of faster and sexier machines, such as the Triumph Street Triple R and Buell Lightning XB12Scg. Like the best friend who is sometimes taken for granted when a fast-paced personality shows up, steals the limelight, and is more fun to hang out with-such was the 650's initial fate. One day, however, I needed to make a stop on the way to work for a short bouquet of flowers for my sister's birthday. Those were not going to fare well in my Ogio backpack and, as I debated this dilemma, my eyes fell upon the 650 with its optional side cases installed. I could carry the flowers in a small vase and leave them fresh on her doorstep. I got on and rolled the bike out of the garage. Since then, I have found myself choosing the G 650 GS more often when doing commuting chores on the local congested freeways. It is a non-intimidating ride, both in size and power. While the G 650 GS is a decent commuter bike, I am perpetually running late and mixing with heavy freeway traffic, so I prefer a more aggressive mount. The affable thumper runs out of steam quickly at highway-plus speeds. Not much is in reserve at 70 mph, so a downshift is required, along with a handful of throttle, to have any sort of passing capability. Also, at engine speeds over 4200 rpm, the mirrors' images turn into a blur. The bike was certainly more enjoyable on holiday-light traffic days. On surface streets and backroads, the G 650 GS is much happier, and so am I. At 423 pounds (claimed wet), the bike isn't light for a single-cylinder 650, but the bike handles well at low speeds due in part to the under-seat four-gallon fuel tank keeping the cg low. With an inseam-friendly seat height of 30.7 inches (an optional Low Suspension kit brings it down to 29.5), it is easy to feel confident and in control. However, the handlebars sit a little bit too high and feel awkWard. At 5' 6" the neutral-position of the pegs was fine, but they were closer to the seat than I would like. Taller riders will definitely need a much thicker seat which will, in turn, lower the relative height of the bars. Early one Saturday morning, I took the sturdy little GS on a longer excursion-I was off to watch an off-road competitive event. I had already been making good use of the stock heated handgrips while commuting on brisk mornings and late evenings, but found them even more welcome on this extended, chilly ride. Though my hands stayed warm, after a couple hours of uninterrupted riding at 70+ mph, the single-cylinder 5-speed engine's buzziness-which I had not noticed on my 20-minute weekday commutes-left my fingers tingling. The seat itself was quite comfortable, though, and the sit-in ergonomics allowed decent wind protection from the fairly short windscreen. A happy surprise was how well the Gelände (off-road) part of the GS worked. My route required a few miles of challenging dirt on a fairly steep, and sometimes sandy, road through a hilly area. I had been dreading one climb, in particular, which had a tight turn at the bottom, giving me no opportunity to take some speed into the ascent. Happily, the BMW surprised me, as the tires held their ground and the plentiful torque allowed me to keep both traction and speed up. Later, the GS handled securely on Dirt Mulholland, a rutted, potholed road scattered with occasional sand, as well as a rollercoaster single-track, hard-packed trail. The 650 GS is not a real dirt bike by any stretch of the imagination, but the bike is willing to get its feet dirty without complaint in reasonable circumstances. The GS is an enjoyable ride in the canyons; the bike is nimble on its 19-inch front/17-inch rear tires and steering is quick. The single-disc front brake capably slows the bike down, thanks to the 650's modest weight and performance, and the standard equipment ABS gives added confidence. 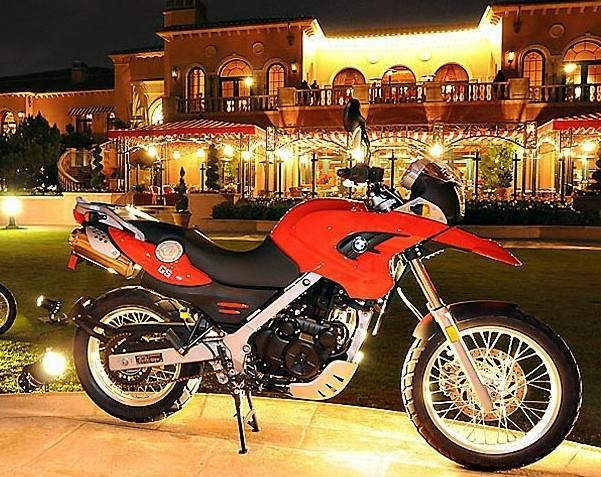 Certainly, the BMW G 650 GS is comfortable, reliable and easy to get along with, features I had, of course, noticed on first introduction. But as we got to know each other better, I was appreciating these solid character traits. And I'm not the only one. BMW has sold over 105,000 of the popular 650 singles since 2000. Introduced as the F 650 GS, it enjoyed eight years of success. However, in 2008, BMW replaced the 652cc single-cylinder powerplant with a 798cc parallel twin engine (but still calling it a 650-strange but true), and kept the F 650 GS name. To add to the confusion, BMW brought back the 650 single in 2009, renaming it the G 650 GS-the bike in this test, if you haven't been able to follow the convoluted story. The odd story behind the names aside, the BMW G 650 GS's consistent success comes from its everyman appeal. Like any motorcycle, you have to ride it on its terms. Not a freeway flyer, the G 650 is an excellent city bike, especially with the expandable side cases installed. On backroads, the GS is easy to ride and there is no reason to let a lack of pavement get in the way of that day's adventure. Besides, any bike that can make it possible for me to put a nice smile on my sister's face is a winner in my book. Standing on the lawn of the Grand del Mar resort can alter your perspective on what constitutes “impressive.” The exquisite lodging for the 2009 BMW G650GS press launch contrasts the more utilitarian nature of the Beemer. Yet this little single-cylinder dual-sport still puts a gleam in my eye. BMW has re-entered the large-bore DS market, or small-bore adventure, however you prefer, with a new-but-familiar model. The first order of business is figuring out exactly what this bike is called, and why. 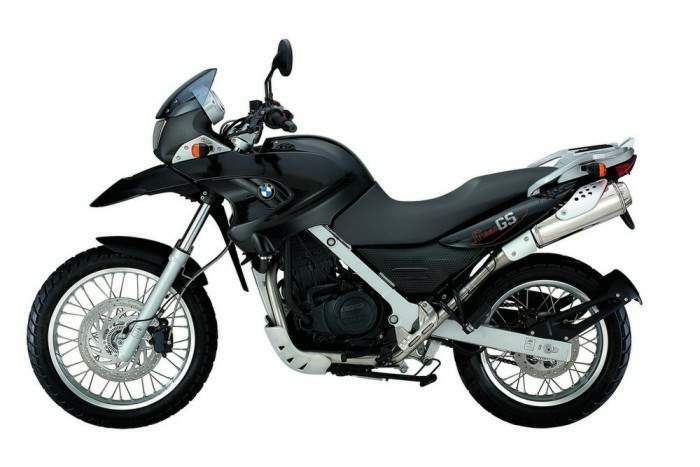 The ‘09 G650GS ($7670 plus $495 freight) is a replacement for the old F650GS and Dakar models. There is a current F650GS, which is also new this year, but it has nothing to do with the popular old model. 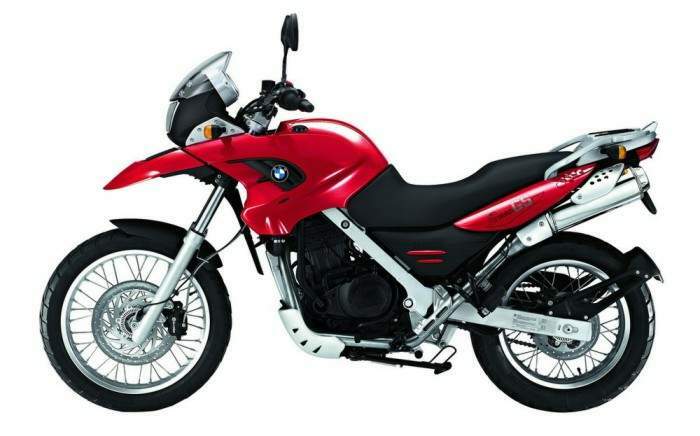 Multi-use adventure and dual-sport bikes from BMW are held in four classifications, G (single cylinder), F (Parallel Twin), R (Boxer Twin) and HP2 (High Performance). That means that the bike we tested is a 652cc Single, while the F650 is actually the 792cc motor shared with the F800GS. That’s why the G650GS is the replacement for the old F650GS rather than the other way around – they’re both Singles. Get it? Simple enough once you get your head around the categories and forgive BMW for its confusing naming convention. We’re not here to evaluate nomenclature, but it’s necessary to understand this bike’s place in the BMW order so that it can be viewed from the proper angle. With that in mind, we flew to San Diego to evaluate how much fun and practicality the G650 can offer. The answer is “a lot.” Our day of testing brought a 200-mile loop from the coast, over Palomar Mountain and through winding two-lanes before heading back into the metropolitan’s urban landscape. The trip sufficiently put the smallest GS through exactly the type of terrain it was designed for. Our day didn’t include any dirt, but after only a couple dozen introductory miles, it became clear that wouldn’t be a disappointment. The rider cockpit was very low. At 5’11”, stopping had both of my feet flat on the ground and knees bent. Once the light was green, raising my boots to the miniscule pegs wasn’t uncomfortable for our morning run through commuter traffic, but by the end of our all-day trip, even with several stops to stretch, the cramped position was starting to become noticeable. The 30.7-inch seat height is extremely easy to mount with its stepped design, and the optional 29.5-inch setup (seat and suspension mods $175) even more so. We didn’t get to sample the lower suspension option, but expect it would be very cramped for even average-sized male riders. Our test bike was a blend of the two versions with standard suspension setup and the lower seat. This is how bikes destined for America will be delivered unless ordered otherwise. The handlebars are low and relatively close to the rider which left my elbows flapping down by the faux fuel tank. Working through the field of professional peers, it was obvious the other men were dealing with similar issues, but the women looked absolutely fantastic in the saddle. The bike isn’t uncomfortable, even with the small stature. Zipping around town or doing a few hours of canyon riding is completely realistic, and the 650GS does an amazing job of both. The 19/17-inch spoked wheel combination increases the off-road capabilities a bit, but is more important in creating very quick steering, as does the dirt bike-levels of bar rotation. Maneuvering the bike for photo shoots or turning around in tight situations was ridiculously simple. Smaller riders, who are obviously targets for this BMW, are going to love how easy this bike is to handle. Mannerisms on the road are also very agreeable. Metzeler Tourance tires are a great match for what the bike’s motor, chassis and suspension are capable of. I didn’t waste any time before tinkering with things. The standard grip warmers work well and the new analog ABS system is very, very good. Turning it off/on requires coming to a stop and pushing a single button located in front of the handlebar crossmember. I accidentally left it off after playing around in a patch of dirt, and once on the pavement again I felt so vulnerable to rider error that I had to pull over and turn the system back on again. The more I use ABS, the more I appreciate it – and it’s a standard feature! This new brake system returns to older technology by switching from digital to analog actuation on the inlet valves. It isn’t a step backWards in performance, however, since digital provides a very “on/off” feel, the analog system is less detectable when operating. Downshifts while aggressively on the brakes trigger slight pulsing as do mindless brake stomps. Otherwise, it’s hard to tell if the ABS is enabled without checking the small indicator light. Another benefit of the redesign was shaving three pounds to help reach a claimed 387-lb dry weight. The 300mm front rotor and 265mm rear are squeezed by a double- and single-piston Brembo calipers, respectively. Nothing overpowering, but the brakes provide a good match for the weight and capable speeds. The shock is adjustable for preload and rebound. Spring tension is tuned via a hand knob located under the rider’s right knee. I even adjusted it on the fly, but found that my personal favorite was with the spring tightened as far as it would go. The ride height difference isn’t all that noticeable, but I felt more confidence in the front end and bump absorption from the 41mm conventional fork remained excellent. Potholes, rumble strips and rough pavement are no problem with the G650GS. High speeds and sudden dips led to a few G-outs, but nothing serious. A passenger or luggage will definitely create a need for greater damping, but for a single rider it was fine. The motor feels pretty standard in its role as a competent 650 Single. Without having other bikes on hand for a direct comparison, I’d say that the Beemer mill is slightly stronger than the unofficial class king, Kawasaki’s KLR650. Vibration levels are the usual with few transferred through the seat, and most felt in the weighted handlebar. BMW engineers are on site at the Chinese manufacturing facility to ensure quality control on what is essentially the same Rotax-designed, fuel-injected, DOHC motor as found in the G 650 Xchallenge. With 53 claimed horsepower at 7000 rpm, (you’re in the red zone at 7500) most of the ride was spent within 2K of redline. Wringing the 650’s neck brings a smile, but not necessarily a big surge of power. The best power is definitely mid- to top-end, but typical use, especially in the city, will likely be less high-strung. The G650 BMW uses gearing to give the motor some life off the bottom. A low first gear makes launching easy, but runs out quickly. We didn’t prefer second-gear starts, but still found the 650GS quicker off the line than our metal-encased neighbors. The paved strip of heaven across Palomar Mountain had us tapping through the gears, mostly second and third. The shifting is typical BMW, somewhat notchy and requiring definitive action from the left foot. Entering a right-hander, I tried to slip in a last-second, toe-tapping downshift, found false neutral and nearly soiled my Scorpion pants. Keep the input solid and positive and it actually shifts well. I was anxious to see if the five-speed had enough legroom on top but am pleased to report that I was comfortable riding at 80 mph without subconsciously lifting my left toe like some nervous tic. Part of the reason might be that the buffeting from the minimal wind protection helps keep your mind off of the engine rpm. A small windscreen atop the single headlight is sufficient for legal city and country road speeds. Guard against weather will be slim, however. One of the reasons we feel so comfortable giving the G650GS a shiny review is that for riders looking to get a full-sized (not mega-sized) BMW for regular off-road use, they can go purchase an F800GS which acts entirely different. This bike has a lot of the same characteristics in terms of capabilities as the standard R1200GS does, just on a smaller scale, which makes it perfect for women in particular. Don’t get off anything more than a gravel road and enjoy the bike’s surprising handling at speed. The G650GS is no more, and no less, than what BMW honchos claim. “The bike is a dual-sport, but lends itself to an urban-type commuter,” says Communications Manager, Roy Olliemuller. This little Single is a street bike first and foremost, and it plays that role very well. If there’s one way to describe the new machine, it’s “easy.” Recalling every situation throughout the ride and the difficulty to negotiate them revealed a surprising conclusion. I hadn’t struggled with the bike a single time or in any way. All aspects of riding the GS require virtually no effort from the rider right from the start. Slinging a leg over the seat is easy even for short riders, the bike fires right up and jockeying out of a parking space is cake. Low-speed handling is much lighter than on a KLR650 thanks to the under-seat fuel storage and extra turning radius between the handlebar stops. Comfy ergos, adjustable clutch lever and competent, ABS-equipped brakes keep the ride safe and manageable. The suspension is well-mannered, chassis stable-yet-responsive and the motor is willing with a usable spread of power. 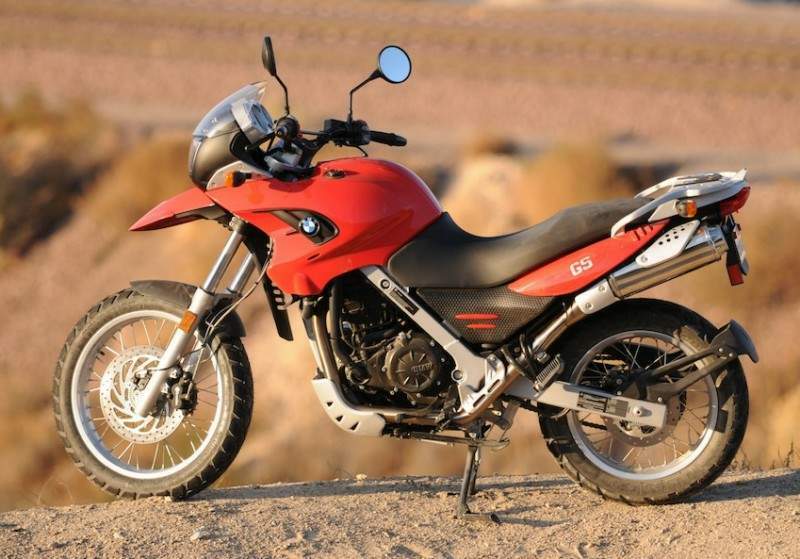 BMW expects the G650GS to hit the ground running with the former sales success of the F650GS and Dakar models (109,800 sold between 2000-’07). They specifically designed it so that the accessories for those original machines will fit directly onto the new G650; a huge advantage for previous owners and for an established support network around the globe. The stature, price and performance make the bike a potential fit for all of BMW’s target consumers: First time buyers, those returning to motorcycling and riders jumping ship from other brands. Everyone initially balks at the MSRP, but the G650GS brings fuel injection, ABS, heated grips and ultra-low seat height – all things that are unheard of in the 650 dual-sport market. “It should appeal and apply to everybody,” Olliemuller says. We think it should too.